For the Filling: In 3 oz of water, drop one teaspoon of True Lime flavoring, add Splenda to taste: should be sweet but tart. Add Vanilla pudding, mix until smooth. Cover and refrigerate. For the Crust: Preheat oven to 350 degrees, Mix Maple Oatmeal, one egg white and 1 1/2 oz of water. Stir until a stiff but manageable dough forms. Lightly coat muffin tin with non-stick spray, moisten hands and with 2-3 teaspoon of dough, roll into balls. Place one dough ball into each baking cup. Press ball down and make as thin as possible to cover tin and form a cup. Bake for around 5 minutes. Cool on a wire rack. Take key lime filling out of refrigerator and stir one packet of True Lime flavoring. Place filling into crusts and top with small dollop of meringue and enjoy! This beautiful pie was going to satisfy the cravings of a homemade pie on a holiday weekend. I didn't have true lime flavouring, so used lime juice instead. Also added a drop of green food colouring, to really get the visual effect of the lime filling. I didn't have the small tart shells, so I used one bigger one, and as a result, had to cook the crust for a bit longer. I also added some Stevia to the meringue, since I tasted it before putting it on, and it really needed a bit of sweetness. With this recipe, I was able to create a stunning pie! It was beautiful, the meringue was a beautiful golden brown (put into the oven on broil for a few minutes), and the pie came out of the tart shell very easily. With my first bite came the disappointment. The pie looked and smelled so beautiful. But the taste was not beautiful! 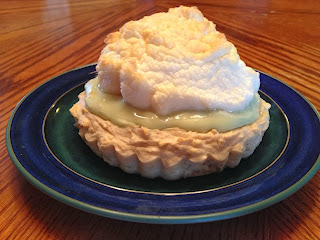 The maple from the oatmeal, mixed with the lime and vanilla from the filling, to the meringue taste, did not go well together at all! The maple oatmeal was really overpowering. The lime taste did not come through as I would have liked. The pudding was a bit thicker than regular pudding consistency, but still wasn't the right texture for pie filling. The meringue was ok, but didn't really add much to the whole thing. I ended up not eating much of the crust, still at the pudding and the meringue, but was truly disappointed. Not going to make this one again. Definitely not worth a restricted and a non-restricted package.